THE WRITING BUDDHA - Opinions | Books | Movies: A Thing beyond Forever by Novoneel Chakraborty!!! I am done reading one of those books by Srishti Publication which got released long back in 2010. I have this book since then but I, finally, got time to read it now. 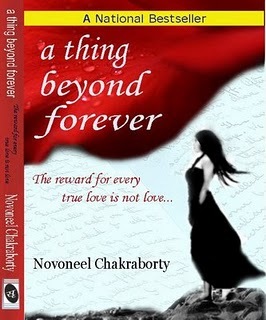 "A thing beyond forever" which also has a tagline "The reward for every true love is not love" is a debut 212-pages novel written by the then debutante- Novoneel Chakraborty- is an Indian author and screenplay writer. His other works include That Kiss in the Rain and How about a sin tonight? His writing is inspired by the likes of Haruki Murakami, R. K. Narayan, and Ayn Rand. It explores various aspects of life, particularly the tug-of-war between the light and dark sides of human nature. Novoneel Chakraborty is a full-time writer. He is working on two Hindi film projects as a scriptwriter. He has also written a script for an award-winning Bengali filmmaker. He maintains a blog titled Novosphere, where he writes one-paragraph stories on inspiration and life. Chakraborty is based in Mumbai, India. A Thing Beyond Forever - The Reward For Every True Love Is Not Love presents Radhika Sharma, a doctor who has an aura of being arrogant and unemotional. Yet, she is a sensitive woman, who still deeply feels the pain of the loss of her one true love. She fell in in love with Raen while they were both at high school. Raen, however, is attracted to another girl, Savera. But eventually, Radhika’s bold expression of her feelings for him turns him towards her. Yet, he still seems to remain attracted to Savera. It is now 15 years since that time. Radhika is now a successful doctor and seems dispassionate and free of any softer sentiments in her life. Yet, an innocent enquiry from a boy at the hospital sets in motion a series of events that prompt her to reexamine her attitude towards life. Radhika, by her own confession, has not even looked at a picture of Raen for years. But, she has always kept his personal diary through the years. She hadn't read it, but the boy’s question prompts her to do so now. The story then unfolds in the form of a personal journal. The plot takes many strange twists and turns, going into philosophy and the idea of rebirth. For Radhika, the answer to her questions about life and love are slowly revealed. And now, she has to make a decision about her future based on these revelations. The book goes beyond chick-lit romance and explores deeper questions. The author attempts to answer some of those questions, while the rest are left to the readers’ interpretations. The interesting, complicated story line and the well-crafted characters are the highlights of this love story. A Thing Beyond Forever does not seem to be a work by a debutant writer instead you will feel as if its written by someone who has experienced a lot in life. It's hard to believe that its by a writer who is as young as me. :-) Book starts with a love making scene which turns out to be dream of Radhika. A good way to start a book by giving an erection to male readers and equally orgasmic sensation in female readers. Haha. As soon as the Raen's diary part begins, the story becomes interesting as we come to know how Radhika's past has been and what connection does Raen has with her. Then the way Raen's confusion over two girls is been narrated confuses us because we find his dilemma obvious. Story makes us sympathize with Radhika. Later on, as soon as the diary parts end, a shocker comes which gives reader an unwanted sensation as he expects a good event. Later on, the little adventure which Radhika goes through also makes us curious to know about what relation does she have with a 9 years old boy. In the end, I would say I was expecting much with the climax but it wasn't up to the mark. In all I would give the book 3.75/5. A perfect read.